Hang some of your favorite outdoor adornments throughout your yard on these Gardman Black Single Shepherd Hooks. 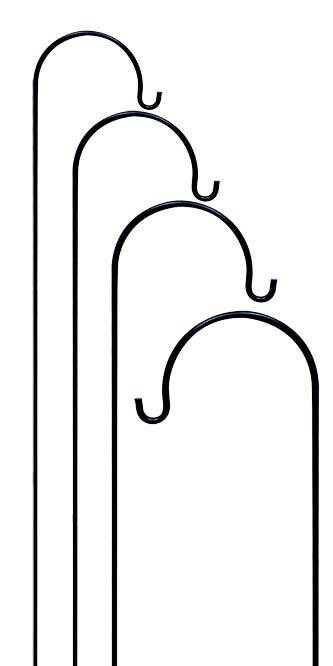 The black color, steel construction, and timeless shape of these 4 hooks lends a classic hint to your yard, while providing several display spots for bird feeders or wind chimes. The steel shaft sports a striking, top curve, which culminates in a small upward curl. The units easily showcase items up to 20" in diameter, and a step-in base on each helps anchor them into your soil. Place these in a group for a busy bird feeding area, or spread them throughout your yard to highlight wind chimes or spinners. Their black, weather resistant coating brings a traditional hint to the yard, and the steel construction remains durable. Enjoy several hanging items displayed in your yard from these Black Single Shepherd Hooks. Note: This case pack includes 4 of the Gardman Single Shepherd Hooks, Black, 7'2"H.